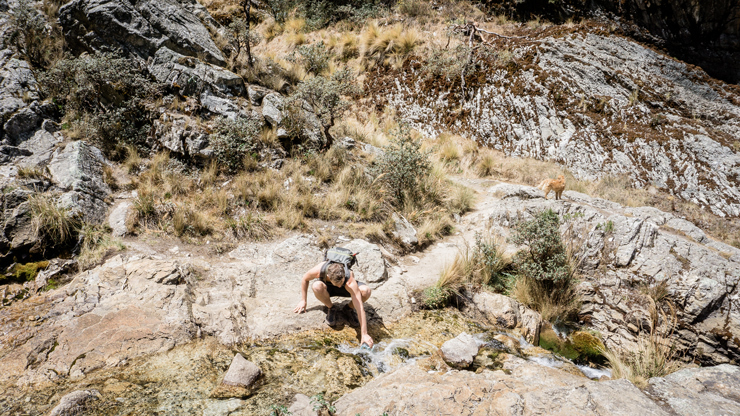 After hiking Laguna 69 we were up for another challenge: Laguna Churup. 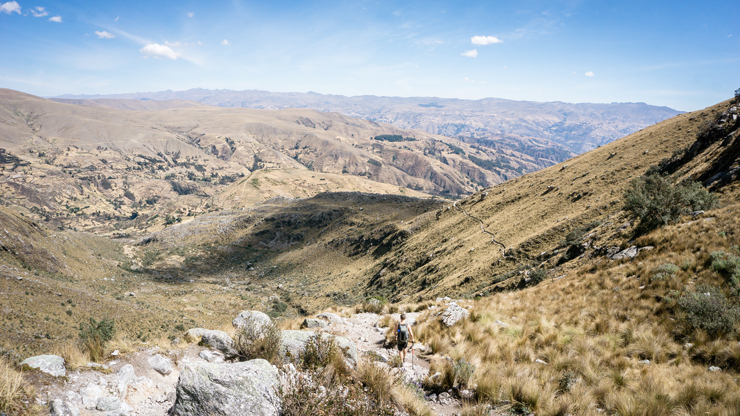 In our opinion, the best day hike we did in the Huaraz area. Why? Well, it’s actually quite obvious: it’s off the beaten path and at least as gorgeous as the popular Laguna 69 hike. There are only a handful of people here which makes it so much more enjoyable and special. Moreover, since it is so easy to do it on your own, you have all the time you want to enjoy this hidden colorful gem! 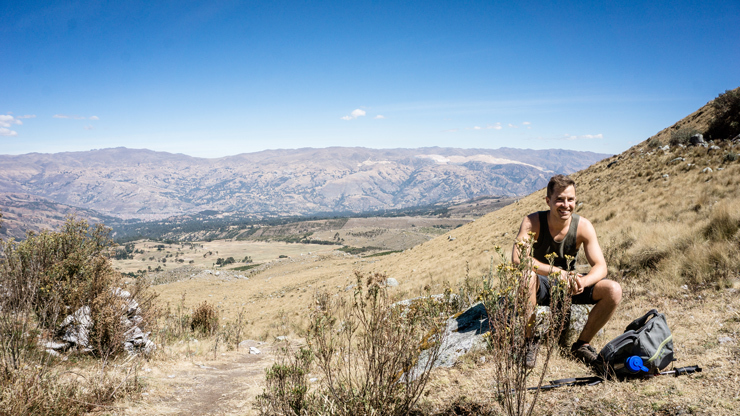 You start at Pitec, which is at 3,850 m (12,630 ft) above sea level. 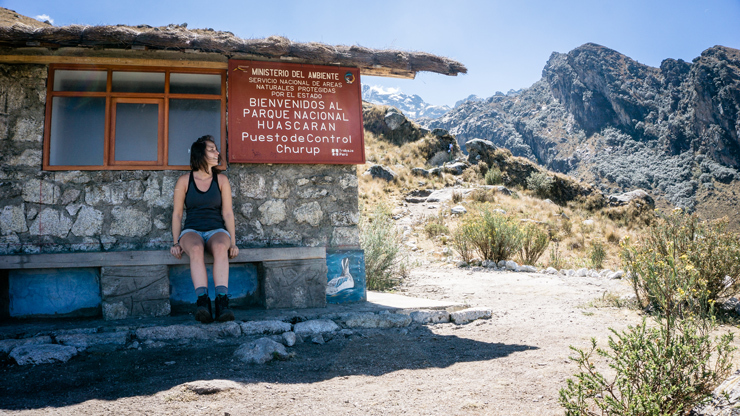 The Laguna Churup is at 4,450 m (14,600 ft) above sea level, but to reach it, you’ll have to defeat a total elevation gain of around 750 m (2,460 ft). Not bad for a day hike at that altitude, right? 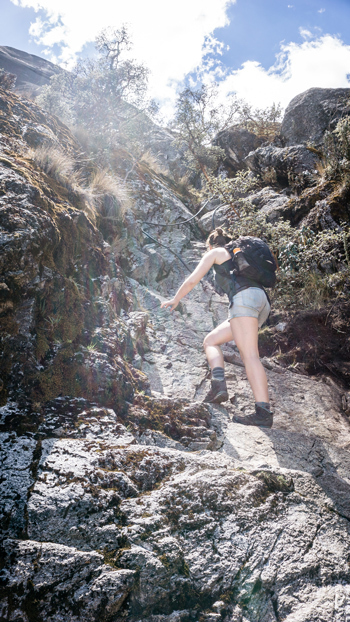 Be prepared for a heavy hike including two tough rock climbing sections. But that made it so much more fun! During the whole hike up, a small cute dog accompanied us. Most of the time, he made the ascent look so easy. Don’t be fooled, he is a professional! The hike immediately starts with a steep slope up to the checkpoint, a small unmanned toll house. Once arrived there, take some time to recover from your first intermediate victory and enjoy the views of the valley and nearby mountains. 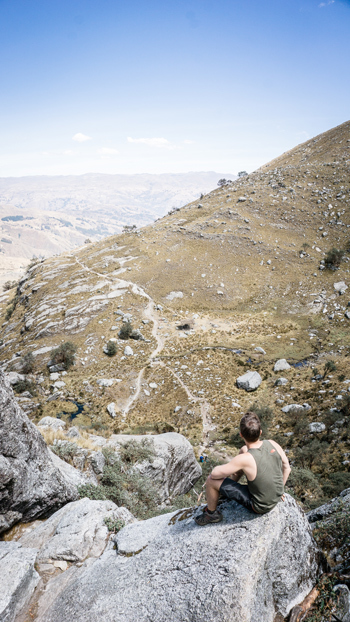 But also take into account that the end is not quite near yet… With a total elevation gain of 750 m, you know the way up there does not come easy! After the toll house the way leads up to a viewpoint (1.5 hour climb). If you are looking behind your shoulder, you have an incredible view on the green mountain valley. If you look in front of you, you will see a vertical granite wall with a cascade flowing through the rocks. Yes, this is the section where you can show your rock climbing skills. From a distance it looks like an impossible free-climbing challenge. Luckaly, once you’re closer, you’ll notice some steel cables that can help you. It certainly is doable, but be careful though! Even the cute little – but professional! 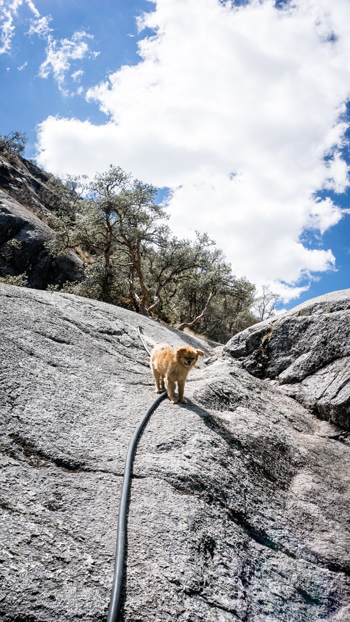 – dog feared this tricky part for a moment. 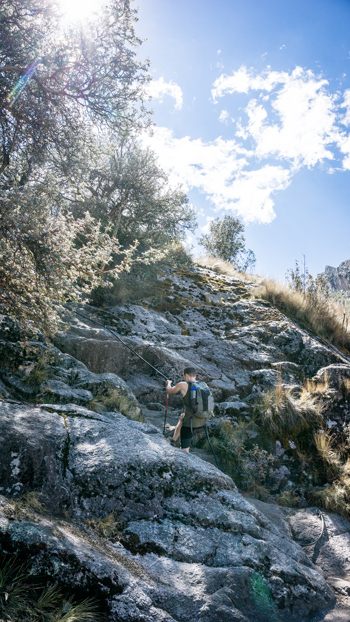 After climbing the rocks, the way up to Laguna Churup is wide open. It’s a fairly easy path from here. Suddenly it comes into view: the magnificent multicolored glacier lake at the base of the mighty Churup Mountain. I don’t think you can imagine a better lunch spot. You have enough time to enjoy this wonderful scenery, walk around and admire the Laguna from multiple angles. Since we still needed to get used to the altitude, it was quite tough on the lungs and took us approximately 3 hours to reach the Laguna. Going down takes about 2 hours. It’s easy compared to the way up but keep in mind that you still have to do it by yourself. Going up already required a lot of energy and the way down is just as steep. You’ll knees will confirm! 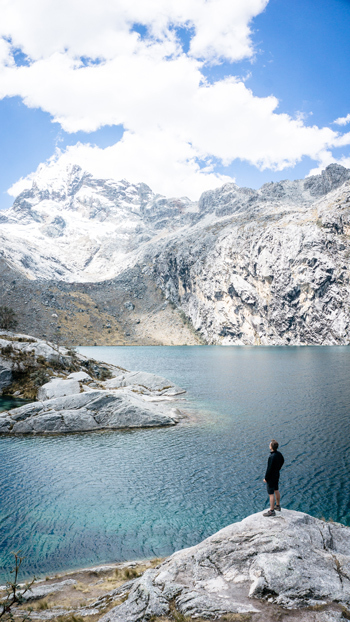 Laguna Churup is an excellent acclimatization hike to prepare for the real job: the Huayhuash Circuito. Check! During travelling, we try to do as much as possible independently, without a guide. 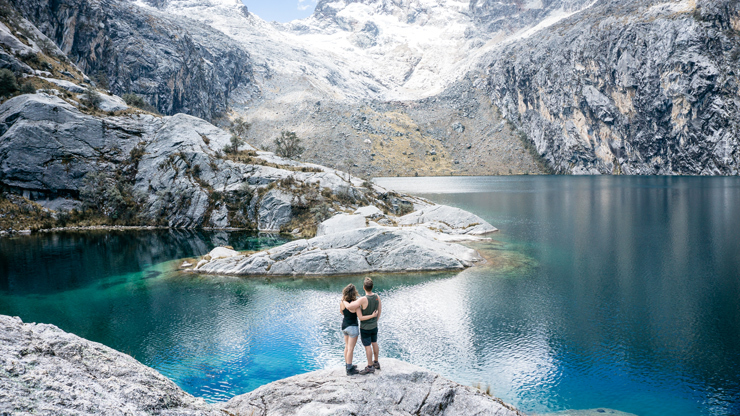 This gives you the freedom to take a break wherever you want, to enjoy the stunning landscapes more intensely and stay as long at this magnificent natural beauty as your heart desires. You’ll probably be here just once, so you’d better take your time to enjoy it to the fullest! 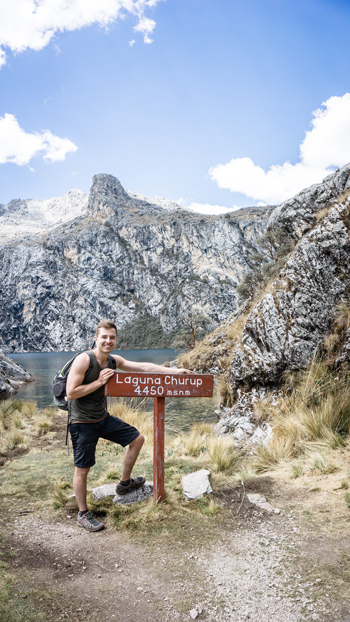 Unlike the far more popular day hike to Laguna 69, it is fairly easy and cheaper to organise the trip to Laguna Churup by yourself. Just take a collectivo to Pitec on the corner of Av. Agustin Gamarra, which is just around the corner from Caleb Expeditions. We read that the first collectivo leaves at 7 am and the last one at 8 am, but you can’t really plan your departure ahead. The drivers wait as long as their collectivo isn’t full, in the hope others will still arrive. We arrived at 7:45 am while our collectivo only left around 8:30 am. But hey, good things are worth waiting for, aren’t they? Fortunately, it takes only about 45 min to get to the trailhead. The cost for the transfer was 15 soles per person each way (approx. €4.00 or $4.50). 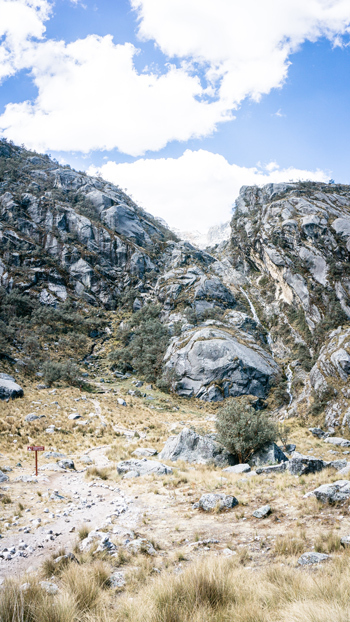 When the driver drops you off at the trailhead, he informs you about the time to get back for the drive back to Huaraz. We were there on time but again had to wait for the van to fill up and waited another hour before starting our return. 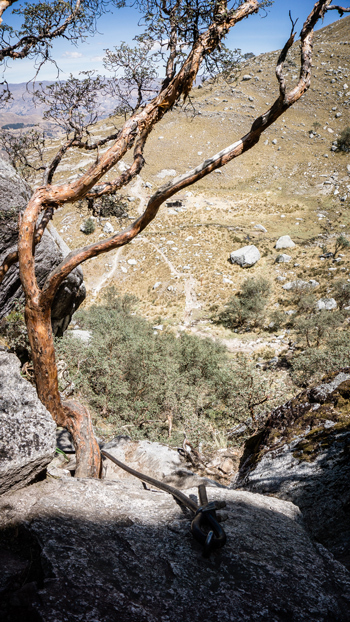 This trail is located in the Huascaran National Park. Expect to pay an entrance fee of 10 PEN (€2.60 or $3.00) at the trailhead. In return, you’ll get a well-marked and exciting trail to an untouched magical pearl! 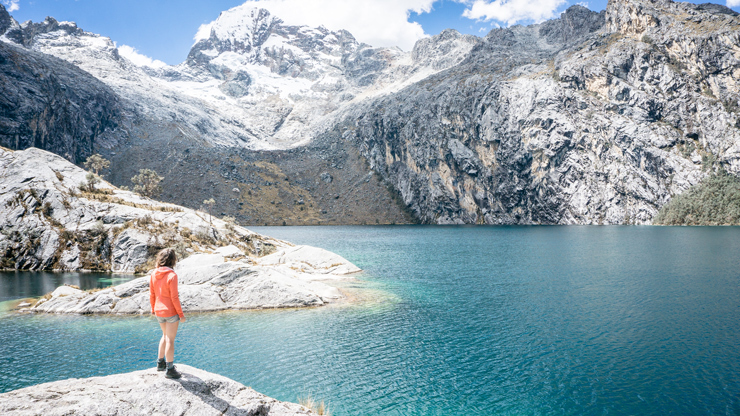 What is your favorite day hike around Huaraz?